After months of waiting, the new Walk Centre primary school was officially opened today, with students, parents, alumni, staff and various dignitaries all in attendance – as well as Chichester College, who have been so instrumental in raising funds for the build. Alex, African Adventures’ Kenya Director and founder of The Walk Centre, spoke to the audience about how the initial idea of the new £82,000 school was discussed with Lisa, group leader from Chichester College, just two short years ago. She and I then spoke on their return to the UK and we agreed to get started on a joint fundraising drive. 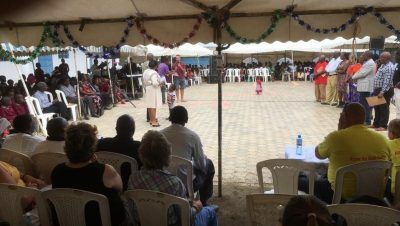 Former student, Eric Mwangi, who was one of the first students The Walk Centre had back in 2005, told a moving story about how he grew up – like most Walk Centre students – on the nearby dump site and had no hope of a bright future. He has just graduated from university and is looking to take up a role in community development. Four more former students, now studying at college, were paraded to an excited crowd. Lisa (who I hope won’t mind me saying) was moved to tears when she was asked to give a speech, where she spoke about the impact that The Walk Centre has had on her own life but also that of students and staff at Chichester College, who have walked on fire, jumped out of planes and taken part in various sporting challenges all in support of The Walk. It was also a proud moment for me. The Walk Centre was the first project I volunteered at in Kenya and it drove me to set up African Adventures. If someone had told me that 10 years later, the project would be where it finds itself now, I would have thought they were crazy. To be at the opening ceremony with friends coming on The Big Bike Ride, my sister Claire (who works at African Adventures) and so many other friends I’ve made in Kenya over the years was special.